Urban Planning Experts discussing about Ulsan's future Industry. 2015 Fall Congress of Korea Planning Association was held at UNIST. UNIST will consistently contribute to a regional development in order to ensure sustainable development. 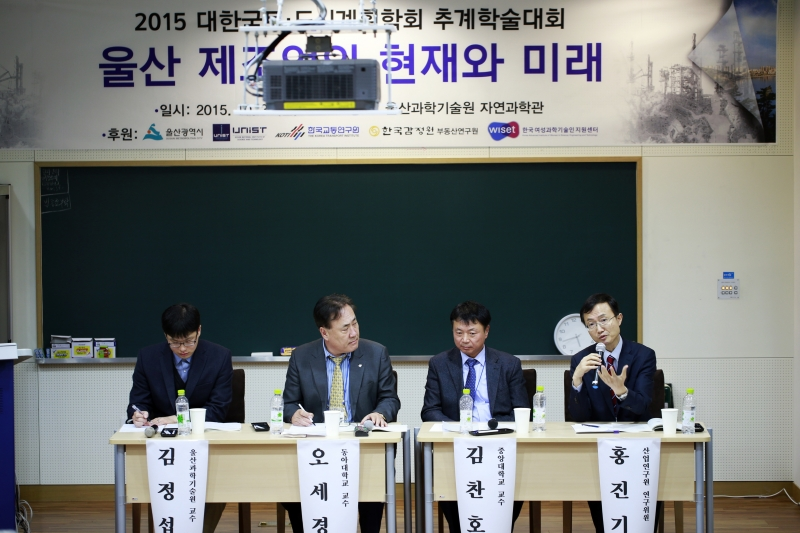 2015 Fall Congress of Korea Planning Association was held from October 30 to 31, 2015 at UNIST. At this congress, Mr. Jaewan Heo, Chairman of Multifunctional Administrative City Construction Committee, suggested the developmental plan for Ulsan Metropolitan City. He says, “To become a global city, it is necessary to build a new metropolitan economic bloc by uniting Ulsan- Gyeongju- Pohang geographically.” Chairman Heo presented with the topic of ‘Ulsan needs to take off to lead the second Hangang River’s Miracle and become a major city in the world” on October 31. Chairman Heo also says, “Ulsan’s industrial structure has been heavily weighted in manufacturing business, but it is time to transit from manufacturing business to producer service business.” Ulsan has been leading the national economic growth in front ever since it was designated as the first industrial complex of Korea. However, it is emergent to discover the new growth power and sustainable strategies because of international economic stagnation. This congress consisted of 14 sessions for graduate students and 13 sessions for urban planning experts. The subjects of sessions were urban restoration, regional economy, environment and disaster prevention, land and housing and so on. Around 300 national and international experts of urban planning and public officials of Ulsan Metropolitan City attended the congress. The president of UNIST, Moo young Jung says, “I hope we can discover the strategies for Ulsan’s future industry and creative ideas about urban structure of space by having this congress. UNIST will consistently contribute to a regional development in order to ensure sustainable development.” 2015 Fall Congress was hosted by UNIST and Korea Planning Association and sponsored by Ulsan Metropolitan City, The Korea Transport Institute, Korea Appraisal Board and Center for Women in Science, Engineering and Technology.